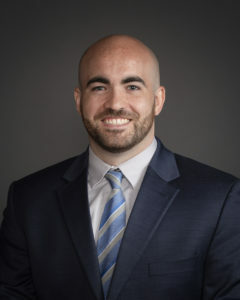 Brian A. Faria is a 2018 graduate of the University of Oregon School of Law in Eugene, Oregon, and recently relocated to the Boise, Idaho area. While at Oregon, Brian gained litigation experience clerking for a law firm in Portland, Oregon and the King County Prosecutor’s Office in Seattle, Washington. Brian’s passion for Intellectual Property stems from his introduction to Trademark and Copyright law in his first year at Oregon, which resulted in him pursuing a concentration in Intellectual Property. Brain in licensed to practice law in Oregon and his Idaho license is pending. Brian is currently studying to take the Patent Attorney Admission Examination to allow him to practice before the United States Patent Office. Brian is an Idaho native, born and raised in Twin Falls, Idaho, and earning a Bachelor’s degree in biology from the University of Idaho in Moscow, Idaho. Brian grew up on his family’s dairy farm where he spent his summers working in the fields and milking cows. After graduating from the University of Idaho, Brian worked for an environmental consulting firm where he evaluated fresh water samples in a lab setting, before attending University of Oregon School of Law. In addition to his professional interests, Brian enjoys hiking, snowboarding, and staying active. He is an avid fan of the NBA and the NFL, along with spending his Saturdays rooting for the Oregon Ducks and the Idaho Vandals.